It was always going to be a tough task to match the previous meeting between Frickley Athletic and Pickering Town, but honours ended even once again in last Saturday’s Evo-Stik East Division game. After sharing eight goals in a drawn game at Pickering in October the return fixture had little of the same excitement and there was no dramatic finish, although the points were shared again in a 1-1 result. Unlike the previous meeting goal scoring opportunities were at a premium this time with the Blues managing just one courtesy of Jacob Hazel. The opening exchanges saw a couple of good efforts from distance by Hazel, the first being saved by keeper Charlie Andrew and the second being unlucky to rebound to safety off the post. 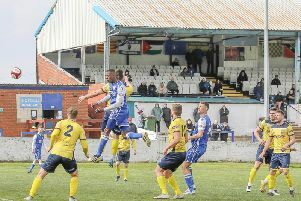 But it was the visitors who broke the deadlock in the 24th minute when their skipper, Nick Thompson, scuffed his shot, but managed to get the ball into the Frickley net from six yards out. Back came the Blues and they were level within nine minutes as good work by Connor Smith and Tyler Walton saw them combine to tee up Hazel who fired home from close range for his 20th goal of the season. Jack Burton came on as substitute for injured striker Ant Wilson at the start of the second half and goalmouth action was to prove scarce. The second period did not see any action of note until the 57th minute when Hazel, Todd Jordan and Greg Young had efforts that went close in quick succession. Frickley continued to probe Pickering’s defences, but the openings just would not come. Ben Algar went closest to finding a winning goal with a free-kick that just cleared the crossbar. Frickley were indebted to keeper Hugo Warhurst for their point as he made a fine save late on. He was awarded the supporters’ man of the match after dominating his area all afternoon, but was pushed close by Hazel, who now has 90 goals in Frickley colours, Jordan who is looking a good addition in midfield, forward Walton and wing-back Smith. A minute’s silence was held before the game to mark the recent passing of John Buckley, who was the Frickley physio for almost 20 years.